Andrea received her BS from Wheeling Jesuit University in 2012 and her MS from Ball State University in 2014. Andrea developed her interest in stream ecology while working in the Stout Lab at WJU where she assessed how elevated conductivity from industrial activities influenced organic matter processing. She then took her interests in streams and ecological processes to the Bernot and Wyatt Labs at BSU where she used microelectrodes to quantify the influence of algal biofilm metabolism on benthic microbial activity and ecosystem dynamics. Andrea is excited to merge her previous research experiences to understand how stream ecosystem processes are influenced by human activities. Raissa received her BS from Universidade Federal de Pernambuco – Brazil in 2014. In 2012, she was part of program Science Without Borders and attended the University of Michigan as an exchange student for a year. 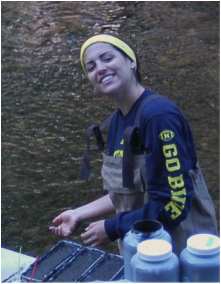 In Michigan, she had the opportunity to work with Dave and other great people while in Allen Burton’s Ecotoxicology Lab in the School of Natural Resource & Environment. Raissa is mostly interested in ecotoxicology and biogeochemistry, and how environmental disturbances affect aquatic communities and ecological processes. Nick has worked in the Costello Lab since spring 2014 having moved back to Ohio after time at the University of Texas - Austin. 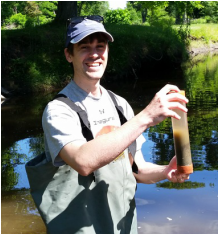 He is involved in all the ongoing projects in the lab including field sampling and helping run the ICP-OES.